In Phantoms in the Brain, V. S. Ramachandran has attempted to emulate the forebears he cites in the Preface, who inspired him to write science that is both informative and interesting to the general reading public. In this he has certainly succeeded, his style is highly approachable, and the content not only comprises interesting titbits, but wholly thought-provoking suggestions and analyses. I picked up Phantoms in the Brain on the basis of a recommendation from a friend more involved in the scientific fold than I am, yet found the book to be readily accessible to these with even only a meagre understanding of the way our brains function. The book is for the most part concerned with the fundamental inner workings of the brain revealed to us through curiously specific medical conditions, often brought about by severe physical traumas such as strokes. Some of the findings are, perhaps, fairly well known by now, yet I’ve no doubt that many will still be quite shocking to most readers. However, Ramachandran keeps the presentation of both old and new findings fresh, in his natural inquisitive approach to each individual problem. His curiosity and novel attitude in dealing with many of these strange rarities of medical science at times remind one of the naïve questioning of a young child, who by approaching problems from altogether unexpected angles can come up with profound thoughts and solutions that would not normally strike an adult. In the form of this popular presentation of at times rather technical science, Ramachandran is liberated to explore the themes discussed to the very brink of conjecture. In such a young area as neuroscience, there is no doubt that such speculation is a necessity, in the face of such a formidable lack of experimental evidence, yet the author does an excellent job of keeping the focus on the actual cases available, leaving the more madcap suggestions and ponderings to the footnotes. The relations of his own personal investigations mark the highlight of the book, with a jocular style that only adds an extra gleam to the clearly sparkling prose that Ramachandran uses to relate what he is so clearly very passionate about. Many of the topics covered are extremely precise in scale, and thereby perhaps quite difficult to relate, but by relegating any complicated elaborations to the endnotes, the book remains perfectly readable despite the occasional paragraph gleaming with words of Greek origin. The text is also punctuated with small tests that the reader can try out for themselves, alone or with the aid of a partner, to get some sense of the kind of symptoms under investigation. Whilst these little optical illusions and sensual tricks obviously cannot replicate the bewildering changes that some of Ramachandran’s patients have suffered, they do help to illustrate some of the hidden workings of the brain on a more tangible scale to the everyday reader. However, these aforementioned endnotes can, as a result of their extensiveness, cause something of a problem, if like myself you’re a reader who checks endnotes as and when they crop up. Not only does that result in a lot of flicking back and forth between the main text and the endnotes, but when doing so to read an endnote that is itself two pages long, it’s quite easy to lose thread of the narrative. In addition, since there is no way of telling whether that endnote is merely a citation reference, an entertaining anecdote, or some detailed explanation of the particular brain anatomy under discussion, it does leave one wondering whether a couple of dedicated appendices, along with a set of regular footnotes or endnotes for citations, would not have been preferable. Whilst this popular science medium allows Ramachandran plenty of scope for hypothesis and exploration of his topics, I couldn’t help get the impression that his conjectures on occasion got rather more ‘off topic’ than would normally be the case. He himself at times corrected himself whilst taking a tangent that led him into the realms of evolutionary biology, for example, no doubt hearing in his mind the criticism of colleagues and friends working in those particular fields. Yet his similar forays into religious and philosophical areas went rather much more unchecked, and the book could probably have been lightened somewhat, had these more meandering speculations been left out. 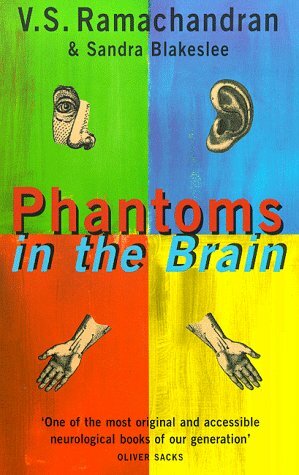 For my own part, Phantoms in the Brain was an interesting read, highlighting numerous facets about the human brain that are yet to be properly explored. Ramachandran’s writing is entertaining and informative, yet not quite as well distilled as it probably should be. However, it is clear from the experiments and investigations he himself has undertaken, that his mind is extremely sharp, and he is not afraid to test out his theories, nor expound them to the greatest extents of conjecture in this little book. I was personally rather disappointed with his conclusion, in that despite the discoveries laid out in the main part of the book, Ramachandran felt it necessary to expound his own theories of the ‘self’ and share his ideas on qualia. 1Ramachandran, V. S. and Hirstein, W. (1997), “Three laws of qualia; What neurology tells us about the biological functions of consciousness”, Journal of Consciousness Studies, 4:5-6, 429-57. Each chapter unveiled another brain process of which we were perhaps previously unaware, each piece pointing to a subconscious that makes up a far more significant part of ourselves than we either realise or, far more importantly, care to admit. Almost as an apology, however, Ramachandran appeared to feel it necessary to reinforce his belief in consciousness, free will, and the self, arguably in spite of the evidence he himself had accrued, ideas which jar with my own personal philosophy. It is perhaps unfair to say that future research will clear up some of the many questions left, since there are only questions left to be answered in this vast area of unexplored scientific territory. Ramachandran’s book offers a glimpse into that vast, uncharted land that does well to follow in the footsteps of those other great pioneers he was hoping to emulate. And he is clearly already on the way to following them outside of the literary field. 1. ↑ Ramachandran, V. S. and Hirstein, W. (1997), “Three laws of qualia; What neurology tells us about the biological functions of consciousness”, Journal of Consciousness Studies, 4:5-6, 429-57.